Rossdorf, Germany: – Construction is now underway of an important extension to the German headquarters of water treatment specialist EnviroChemie. 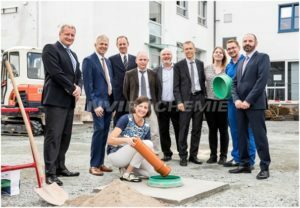 Rossdorf’s mayor, Christel Sprössler, laid the foundation stone for a new office and administration building at the EnviroChemie GmbH headquarters in the town, near Darmstadt in Hesse. The ceremony in late August was attended by the company’s Management Board, staff and guests. Ms. Sprössler said she had been ‘delighted’ with the continuing growth of EnviroChemie which has found increasing markets for its plant engineering and industrial water technology in recent years, not least in Asia. “Our steady growth is the principal reason why the company has made the decision to invest in a new building now that its premises have expanded and our new technology center and chemical production facility are now in full operation,” commented EnviroChemie spokesman, Dr. Jörg Krause. The three-storey building, with overall floor space of around 2100 m², will provide new office spaces for 85 employees. It is being constructed on a site previously occupied by the original assembly hall at Rossdorf. The highly energy efficient new building will feature a solar-powered charging station for pedelecs, with facilities for other electric vehicles also in the pipeline. The project commenced in July 2017 with an expected completion date set for December 2018. This ISO-9001 certified engineering company was founded in 1976 and offers a holistic range of “Made in Germany” branded products and services based on chemical-physical, biological and membrane filtration processes, whose pedigree relies on its long list of research achievements and patents. EnviroChemie products are developed and supplied from three sites in Germany and Switzerland and the company operates 23 sales and service offices worldwide. Click on EnviroChemie expands Rossdorf HQ for other information.